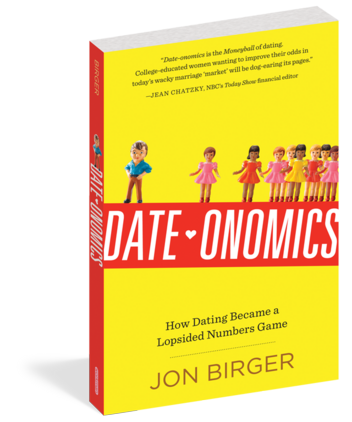 (P1) In his new book, Date-onomics: How Dating Became a LOPSIDED Numbers Game, author and former Fortune and Money columnist Jon Birger CRUNCHES SOME NUMBERS from the U.S. Census Bureau and other social surveys in order to SHED SOME LIGHT on dating challenges in America. (P2) Aside from revealing a statistical “man SHORTAGE,” Birger explains how college-educated men and woman often limit their own dating OPTIONS, and (perhaps most surprisingly) says that the key to expanding your dating POOL could be as simple as a trip to your local SUBURBS. (P3) First, tell us about that man shortage. In the book, Birger points out that there are four young college-educated women for every three young college-educated men in our country. “What’s really interesting is that the gender ratios are more lopsided in rural states like Montana (52 percent more college-educated women than men, ages 22 to 29) and West Virginia (61 percent more college-educated women than men) than in urban states like California and New York,” he says. (P4) Why are we focusing so much on college degrees? (P5) “I definitely do not believe that college education makes someone a quality guy,” Birger says. In fact, “The RELUCTANCE to date across socioeconomic lines is a major reason why there is a ‘man DEFICIT‘ for college-educated women,” he explains. “There have been multiple studies showing that college-educated Americans are increasingly unlikely to marry someone lacking a college degree.” As a result of that, “My focus is on the college-educated dating market,” Birger says. (P6) What, exactly, is the problem single women and men are having with dating right now? (P7) The current hot topic seems to be our so-called hookup culture—a large amount of people preferring casual relationships to LASTING, committed ones. “I’m not trying to be the MORALITY police, and I’ll even go so far as to say that this isn’t entirely bad,” says Birger. But for women and men who do want to get married or have a committed relationship, it can be FRUSTRATING. (P8) What do you suggest for those who want a committed relationship, but aren’t meeting partners with the same goals? (P9) “Based on my research, I can say that women and men who are not meeting the right person should consider expanding their dating pool, either geographically or by education level/social class,” Birger says. (P10) His suggestion? Spending more time in the suburbs: “Odd as it sounds, suburbs tend to have higher ratios of single men to single women than city centers, at least among college grads,” Birger says. So if you can’t seem to meet LIKE-MINDED individuals on dates in your city, a trip out to country for the day could change all that (or, at the very least, provide a little FRESH AIR). How have dating and relationships been changing in your country? Is there a “man shortage” in your country? Why are people reluctant to date someone with less education? Would you (or have you) dated someone at a lower educational or socio-economic level than yourself?